Henry Meacham just tripled up after getting it all in holding K♦K♥ against Sallie Stohler's A♥K♣ and another player's Q♠Q♥. The board ran out 7♣7♠4♠6♥7♦ giving Meacham the bigger full house, and leaving Stohler with just 200,000. According to the table, Nick Palma recently got it all in holding king ten against Jeremy Meacham's A♥J♣ . The board ran out J♠9♠6♦2♥8♣ eliminating Palma in 17th Place. 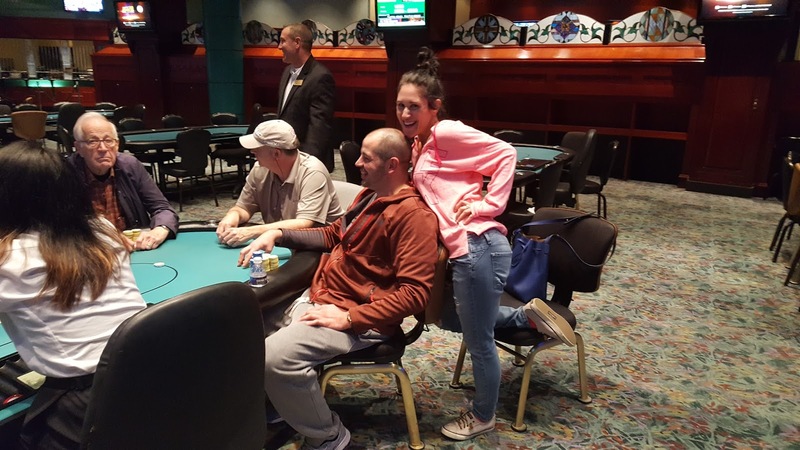 He is taking home $1,584 for his finish. There are 53 players (of the original 112) still in Event #17 and they are currently playing Level 13 with 800/1,600 blinds and a 200 ante. The average chip stack is currently 63,396. The remaining 18 players in Event #16 are now on dinner break. They will return to play Level 24 with 10,000/20,000 blinds and a 3,000 ante. 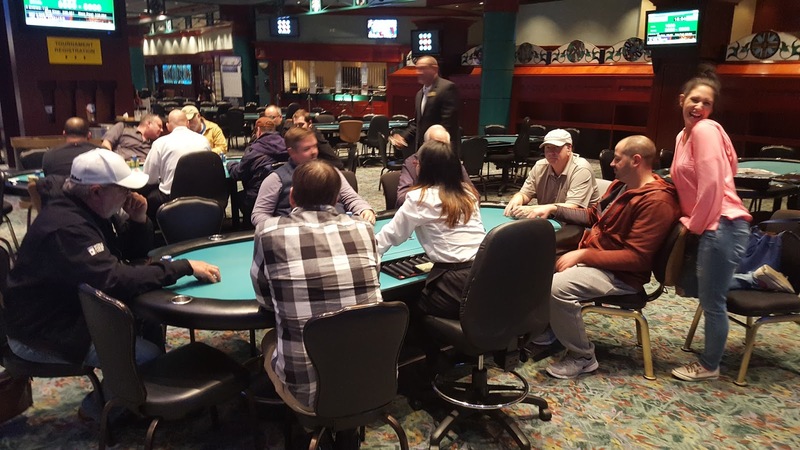 There were a total of 112 players in today's Event #17 ($400 NLH Freezeout Big Stack) Event, generating a prizepool of $38,024. The Q♠4♣3♣Q♦4♦ board double pairs on the river, resulting in a chopped pot, saving Magner from elimination. The board runs out J♣5♣5♠3♥K♦ awarding Morales a double up. The board reads Q♠10♠6♥3♣ and Henry Meacham checks in middle position. James Magner bets 100,000 in the cutoff, and Meacham announces that he is all in for 216,000. Magner tanks for nearly a minute before releasing his hand. Meacham shows the J♠ and mucks his other card face down as the pot is passed over to him. David Grandieri limps in from middle position. Steven Brackesy limps in the hijack, Quan Quach limps in the cutoff and Hamid Mezhoud shoves all in for around 43,000 on the button. The small blind folds and Michael Sanders announces that he is all in from the big blind for around 100,000. The original limper Grandieri announces that he too is all in, having both players more than coverd. Brackesy quickly folds and Quach takes a few moments before mucking his cards. 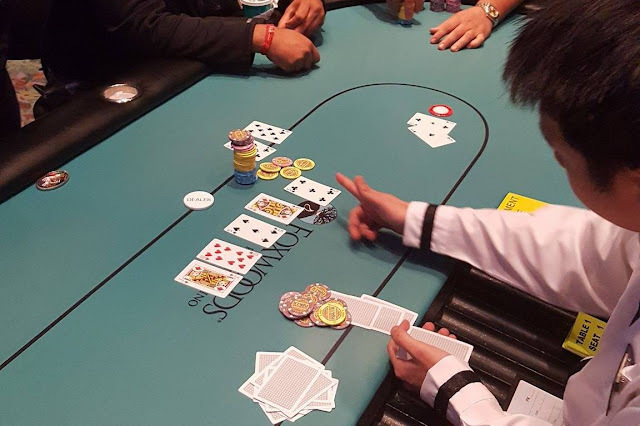 The flop comes A♠Q♥5♦ giving both Mezhoud and Sanders a pair of aces and Grandieri says, "Oh come onnnnn." The 7♦ turn and 5♥ river mean that Mezhoud will more than triple up, and Sanders is awarded the side pot of 14,000. Poker Pro Nick Palma started today with 94,000, and has been consistently and patiently building all day. He is now sitting with 280,000 in chips at the start of the 4,000/8,000 blinds. There's around 20,000 in the middle and a board reading K♣9♠7♥. Quan Quach checks in the big blind and Antonio Bueti announces that he is all in from middle position. 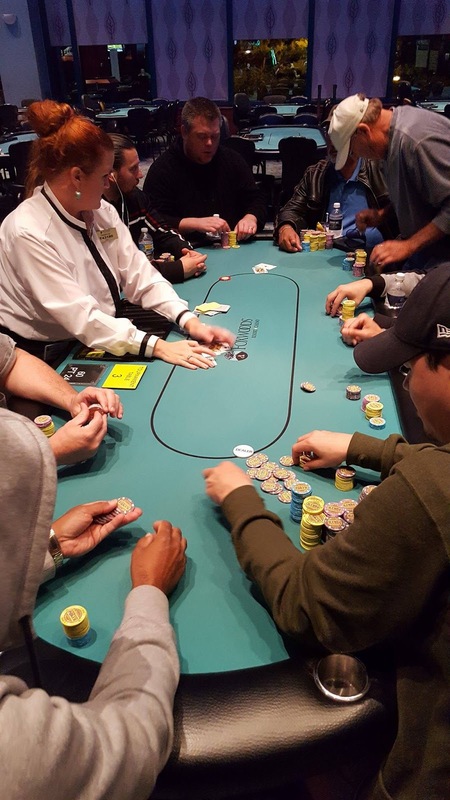 Quach asks for a count after seeing the dealer count out the nearly 45,000 in chips, Quach calls without hearing the exact total. The A♠ turn and 5♣ river do not improve Bueti's hand and he is eliminated in 47th place. Zach Deneen became the official bubble after Mandeep Gyani hit a set of tens and Deneen failed to improve with A♦K♣. 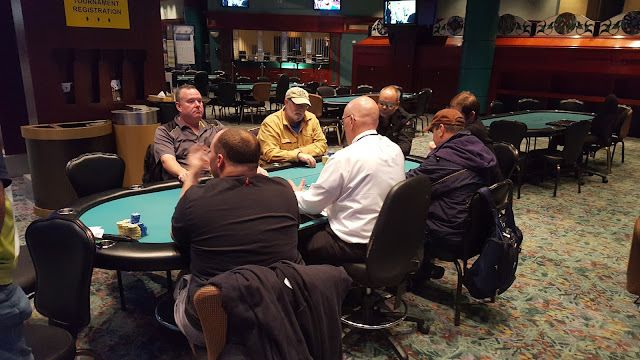 A total of 74 players made it through to Day 2 in the $400 NLH Multi-Flight PPC event (38 in Flight A, 37 in Flight B, and one person who bagged in both flights). Those players will return at 12:00 noon on Wednesday to play down to a winner. Play will resume at Level 16 with 1,500/3,000 blinds and a 500 ante. For a look at the prizepool for this event, please ses this link. Here is a look at the 37 players advancing to Day 2 from Flight B of the $400 No-Limit Hold'em Re-Entry Event #16. These 37 will join with the 38 that bagged in Flight B to play Day 2 tomorrow (Wednesday) at 12:00 noon. This was a best stack forward event and one player, Sean Carlson, bagged a second stack in Flight B. He originally bagged 90,000 in the first flight, and will be carrying forward the 200,000 he bagged in Flight B. Given the double bag, there will be a total of 74 players advancing to Day 2. Below is the list of all players that bagged in Flight B. Facing a raise from a player in early position, the General shovs all in on the button for around 60,000, and the player calls. The board runs out J♦10♥5♠Q♦5♣. General's pair hold, and he doubles up just shortly before the start of the last level of the night. William Frederick raises to 3,200 in middle position and another player in later position calls. It folds to Michael Sanders in the small blind who makes it 15,000. The big blind folds and with action back on Frederick, he announces that he is all in, having both players covered. The later position player folds, Sanders pauses for a few seconds, checks his cards, and then calls. The board runs out Jack high awarding Sanders the pot. The dealer counts out Sanders' 95,600 chips. "He had been raising a lot, I thought he was just trying to squeeze," Frederick said to his neighbor as the chips are being passed across the table to Sanders. There were a total of 214 entries in Flight A, and 236 entries in Flight B of Event 16, making the combined total of 450 entries. 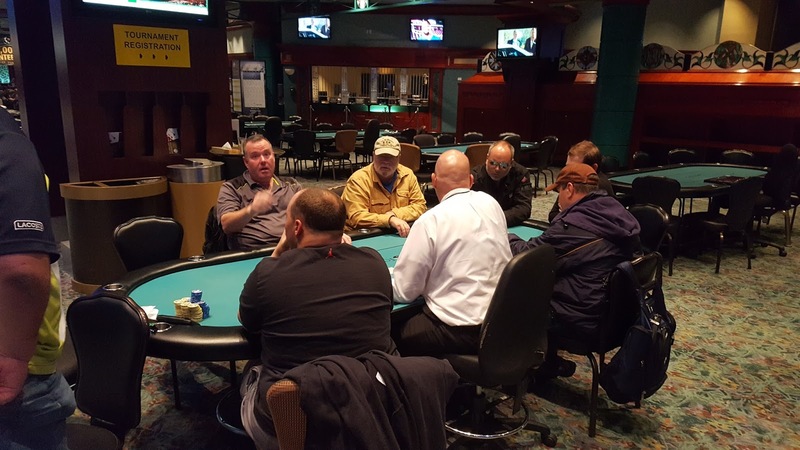 The prizepool totals $142,775 and 54 people will make the money tomorrow on Day 2.